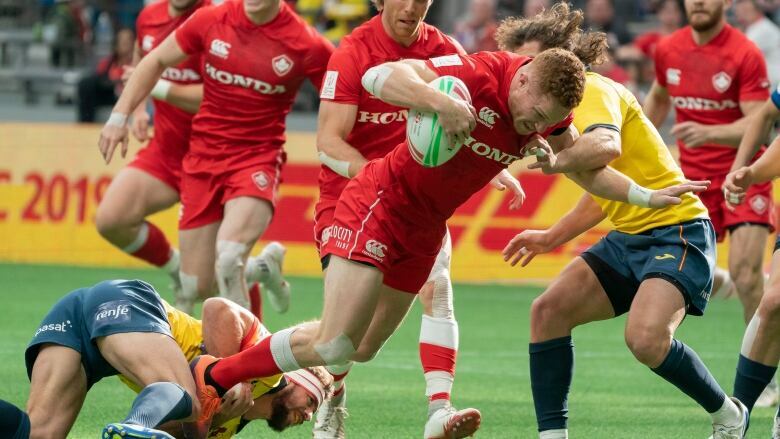 After advancing to the Challenge Trophy final without two of their players due to injury, including their captain Nathan Hirayama, Canada bowed out to Australia 35-21 at the HSBC World Rugby Sevens tournament in Vancouver. A depleted Canadian team ran out gas, losing 35-21 to Australia in the Challenge Trophy final Sunday at the HSBC World Rugby Sevens tournament in Vancouver. Injuries reduced Canada's roster to 11 players from 13. The gruelling toll of playing six games over two days also showed as Canada struggled to crack the Australian defence. "We're down a few guys, but the boys really ground it out," said Harry Jones of West Vancouver. "I'm really proud of them." Canada began the two-day tournament with an embarrassing 38-7 loss to Samoa Saturday morning. The team regrouped to win four straight matches before dropping the consolation final to finish 10th among 16 teams. "We had to marshal the troops a little bit," said head coach Damian McGrath. "There were a lot of positives. We showed a glimpse of what we were capable of if we were well resourced, well supported and staffed like other teams." At the beginning of the season the Rugby 7s players were in a dispute with Rugby Canada management over compensation and the dismissals of Lee Douglas, who acted as a strength and conditioning coach, and long-time manager Brian Hunter. Jones alluded to the dispute when summing up the weekend. "A lot of things go into it and the boys will never complain about anything," he said. "A little more support would be great. "We lost a few guys due to a lack of support and the proper [strength and condition coach] full time. It does hurt at the end of the day, but those boys put it out there 110 per cent and that's what good Canadian boys do." South Africa defeated France 21-12 to win the tournament championship. Fiji, which won last year's event in Vancouver, defeated the U.S. 24-14 in the bronze-medal game. The U.S. continues to lead the overall Rugby 7s standings with 113 points, followed by New Zealand (106), Fiji (101) and South Africa (89). Canada is 12th with 35 points. The competition drew a total attendance of 73,819. Canada advanced to the consolation final by overcoming a 14-0 half-time deficit to defeat Scotland 19-14. Isaac Kaay crashed over for the winning try on the last play of the game. "We have been grinding all week," said Kaay, of Kamloops, B.C. "We're showing now how much grit [we have]. There is no give-up on this team. That's what Canadian rugby is all about." Canada's best finish this season in Rugby 7s was a tie for seventh at a tournament in Hamilton, New Zealand. Reaching the Challenge Trophy final is a confidence boost heading into the final four tournaments of the season. "No one likes to play in the bottom half," said Kaay. "This is the first semifinal of any kind we've won this year. It's a step in the right direction for us." Among the injuries, captain Nathan Hirayama was sidelined with fractured ribs while Adam Zaruba was out with a foot injury. One of the players filling the void was Connor Braid, who scored six tries over the weekend and helped set up two scores in the win over Scotland. "We were joking we have to get a bigger door to fit his head through," Kaay said about Braid. "The guys has grown in confidence, been a real big leader for us. "He's changed as a leader as the weekend has gone on. As a player it's amazing to watch him evolve from a guy who would speak a lot to a guy who is saying very little and is just showing in his play." Canada began Sunday with a 33-7 romp over Spain. Braid led the charge with a pair of tries. The Canadians rode a roller coaster of emotions Saturday. After being humiliated by Samoa the team battled back to upset defending Olympic champion Fiji 26-19, then defeated Kenya 36-21. Canada needed help to reach the championship quarterfinals but was left on the outside looking in when Fiji defeated Samoa 31-17 in the final B Pool game. The top two teams from each of the four pools advance to the elite quarterfinals. Samoa, Fiji and Canada all finished with 2-1 records, but the Canadians didn't advance because of a points differential. The top four finishers after the 10 Rugby 7s tournaments automatically qualify for the Tokyo Olympics. With the U.S. secure in a top-four position, it makes Canada's route to the Olympics through a qualifying system easier. The crowd at BC Place Stadium looked like an audition for a David Lynch movie. People dressed like superheroes sat beside furry animals. Fairies with wings lined up for beer beside rainbow-colour cows. There were Viking hats, people in loud Maple Leaf coats, leprechauns, unicorns and some costumes that simply left you wondering. The next 7s tournament is in Hong Kong April 5-7.